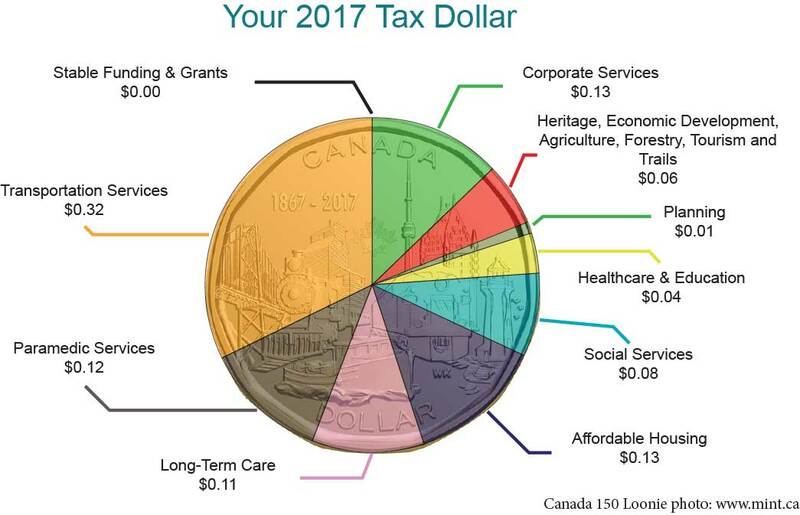 But have you ever wondered how each tax dollar is spent? The image below shows the 2017 budget broken down into different functions. As you will see, there’s a lot more to the budget than roads and bridges. In fact, of every dollar spent, $0.48 goes directly to helping people – specifically people at risk. See for yourself. The 2017 Grey County budget was approved on November 22, 2016. The $144-million operating and capital budget maintains the service levels residents expect, and expands services in the areas where it’s needed most. The 2017 budget includes a net increase of $1.4 million. This amount will be funded from new assessment growth and a tax rate increase of 1.83%. The increase equals about $16.33 for the average residential property in Grey County assessed at $250,000, or around $10.50 per person. In 2017, Grey County will begin implementing public feedback collected during Recolour Grey, the County’s five-year review of the Official Plan. Other projects include updating the County’s Forest Management Plan and developing a recreational trails strategy to provide a plan for maintenance and access to the County forests. The 2017 budget continues implementing the Economic Development Strategy and Destination Development Action Plan. It also includes funding for the SWIFT broadband internet project, and building on Grey County’s recognition as one of the Smart21 communities of 2017. Maintaining more than 877km or roads is no simple task in this part of the country. In 2017, Grey County will continue investing into our roads infrastructure with planned capital projects and ongoing maintenance and replacement of equipment. Winter maintenance will also slightly increase. Each year, Grey County Paramedics respond to more than 19,000 emergency calls. In recent years, calls to the Chatsworth area have increased. Response times are critical during an emergency. The 2017 budget includes funding for a new base in Chatsworth will ensure paramedics can reach the area quickly. The base will also relieve pressure from surrounding bases. Grey County delivers social housing programs that support people in need of housing and shelter. The 2017 budget supports the operation of 888 rent-geared-to-income housing units, and an additional 450 non-profit housing units. On top of day-to-day needs and rising utility costs, we are steadily updating and renovating units to ensure they are safe and secure. The needs of residents entering long-term care are changing. An increase in nursing hours in the 2017 budget ensures the residents of Rockwood Terrace continue receiving high-quality and compassionate care. Grey County continues to save for future long-term care redevelopment needs in the 2017 budget. The County offers a range of supports for agencies, child care providers and parents including fee subsidies, child care licencing, early childhood education and more. Ontario Works provides financial and employment assistance to residents in need. Grey County has a stable Ontario Works caseload of around 1,350 clients and participates in other social initiatives such as: the MOVIN’GB rural transit pilot, the data sharing network with community partners, the drug task force, and other projects. Grey County Children`s Services offers programs, subsidies and information for parents, and a range of supports for agencies and child care providers. The County is also the co-lead for the Ontario Early Years program with centres all around the county. The Corporate Services budget captures the costs of doing business, keeping the lights on and maintaining properties and facilities. The budget also includes council services, staffing, running the Provincial Offences court, Health Unit funding, IT supports and other community funding.